The world gathers on the Korean Peninsula today, united by the Olympic spirit: in solidarity, mutual respect and friendly competition. The Olympics and Paralympics showcase the best of the world’s athletic achievements. And the best of humanity. Let the Olympic flame shine as a beacon to human solidarity. Let the Olympic Truce help spread a culture of peace. Let the Olympic spirit guide our actions today and every day. Thank you. Gahm-sah Hahm-ni-da 감사합니다. Can the Olympic Games promote a Culture of Peace?
. 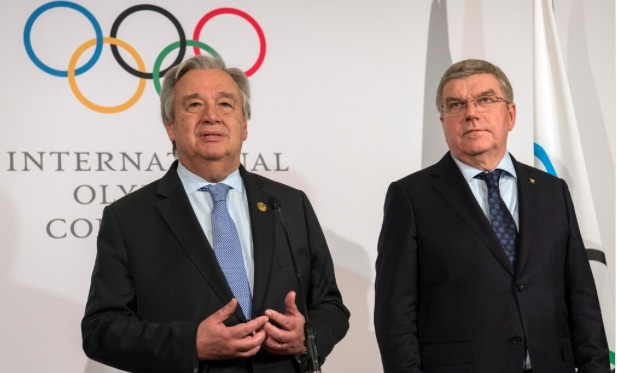 . . United Nations Secretary-General António Guterres called on everyone to recognize and promote the Games’ universal message of peace and tolerance. “The Olympic spirit allows people to be together, from all over the world, to respect each other, to assert the values of tolerance, of mutual understanding that are the basic elements for peace to be possible,” Mr. Guterres told journalists in Pyeongchang. Obviously, in the present context, he said, there is a lot of attention for this message of peace in relation to the Korean Peninsula, but the Olympic message of peace is not local. “It is universal. It’s for the world. It is valued in Korea as it is valued everywhere where we struggle to try to address the many complex conflicts that we are facing,” he said. The UN chief also extended his appreciation and pride to be at the Winter Olympics and highlighted the cooperation between UN and the International Olympic Committee (IOC), as well as the values for which the IOC and its sister organization, the International Paralympic Committee, stand. The Winter Olympics opened earlier today (local time) with cultural and artistic performances as well as the customary parade of athletes, which was the delegations from the Democratic People’s Republic of Korea and the Republic of Korea under one flag, carried together by a sportsperson from each team. Also today, the opening ceremony saw the conclusion of the long journey of the Olympic Torch that started in November 2017. In the last leg of its journey, the flame was carried, among others, by Miroslav Lajčák, the President of the UN General Assembly and Thomas Bach, the President of the IOC. “[It] is a symbol of peace, a symbol of youth, a symbol of sport, communication, a symbol of tradition, a symbol of hope.” he said.